We don’t have a photo of Ann’s maternal grandmother Ellen Carey, an Irish Catholic who came to Manchester as a young child in the 1880s. Ann talks about her as a major influence, teaching her to cook, to sing Irish rebel songs and to be self-reliant. Ellen ran a Chandlers at Salford dock and would look out for the Black seamen who arrived in the city ‘help them find lodgings and look after them, make sure they didn’t spend all their money or get ripped off’. This is how she met Ann’s grandfather, a Liberian seaman, during the First World War. I always thought she was brave, for doing what she did, coming over from Ireland and having to raise a family and start a business, and also being brave enough to marry outside of your own group, particularly at a time when there were very few Blacks in the country. But I don’t think it bothered her. ‘I’ve done what I’ve done’ you know ‘it’s not my problem’ kind of thing. This defiant attitude is perhaps the greatest thing Ann inherited from her grandmother. 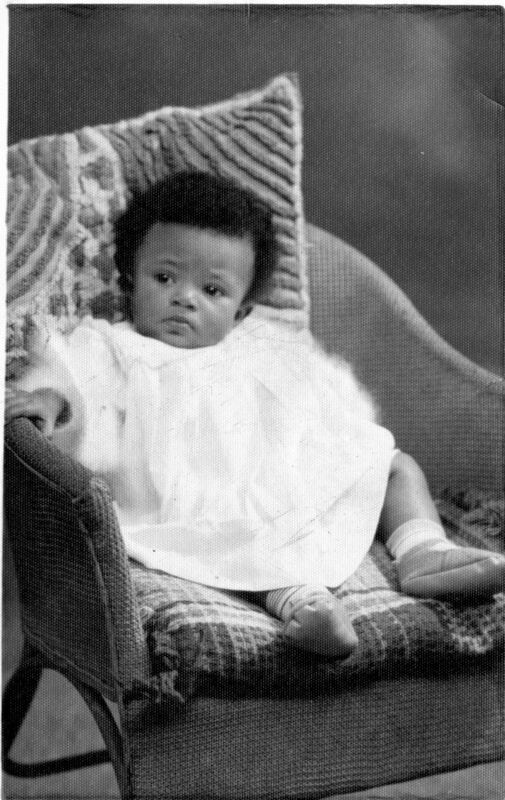 Mary Dixon (later Adeyemi), Ann’s mother, was born in Salford in 1920. Ann remembers her talking about two instances of prejudice she experienced whilst growing up. As a Black woman she was barred from working in the munitions factory during the Second World War in case she was an enemy alien (‘You know like, “please!”’ scoffs Ann), and as an Irish Catholic being pelted with stones and mud by Protestant children during the Friday Whit Walks. Ann’s father, James Adeyemi (also known as Micky), was born in Liberia but, because of tribal conflicts was raised in Sierra Leone. As a young man he travelled extensively with the merchant navy, finding himself in Manchester in the 1930s. Ellen, along with some other White women who had married Black men, had by now set up a support group for Black seamen arriving in Salford, which included putting on social events and dances for them to meet local girls (‘interested in having a serious relationship, not prostitute types’). It was at one of these dances that Mary and James met. They were historians, because they held the information about their experiences and the experiences of possibly some of the people of their generation and they passed that, you know, ‘you are your parents, your grandparents, you carry your ancestors with you so you have to respect them.’ So they taught me to be a historian before I became a historian. Yes, because it was like ‘hidden histories’. I’ve always been obsessed with hidden histories. Ann’s grandparents opened a second shop once they were married; a convenience store in Flat Iron Market in Salford. This is part of the insurance claim for when the shop was bombed during the Second World War. Mary and James (also known as Micky) with friends, 1960s. There are many similar photos in the collection of the couple having fun with friends, and later of Mary, who outlived her husband, with groups of female friends. James Adeyemi’s harbour pass for New York, while he worked for the White Star Line in 1944. Ann remembers the treasures he would bring back from his trips to America – beautiful fabrics, toy Chrysler cars and ‘New York red delicious’ apples, a real treat while the UK still had rationing. James Adeyemi at Ann’s graduation for her second degree in Education, from the University of Manchester, 1983. Ann taking part in the local parish Whit Walk, 1950s. Mary had had mixed feelings about Ann taking part in the bigger Manchester Whit Walk as she (Mary) had faced abuse from Protestant children when she joined them as a child. In the end though, Ann had chickenpox on the day and had to stay home. Ann with friends, c. 1970. This photo may be from her time studying History at Notre Dame College in Liverpool. Ann’s school report from Bury Convent School, 1966. It is very clear from her school reports that she worked hard at the subjects that interested her (History, English, Art) and didn’t waste energy on the ones that didn’t. Letter of congratulations to Ann on highly successful completion of her first degree in History. This entry was posted in Opening the archive and tagged african community, Ann Adeyemi, cheetham hill, family history, irish community, salford, salford port, whit walks by aiucentre. Bookmark the permalink. What a lively history – I must read the full thing!